Welcome to Canadian AI 2018! The 31st Canadian Conference on Artificial Intelligence took place in Toronto, Ontario at York University, May 8 to May 11, 2018. The best paper award went to Yang Xiang and Dylan Loker for their paper De-Causalizing NAT-Modeled Bayesian Networks for Inference Efficiency. The best student paper award went to Laurent Jakubina and Philippe Langlais for their paper Reranking Candidate Lists for Improved Lexical Induction. 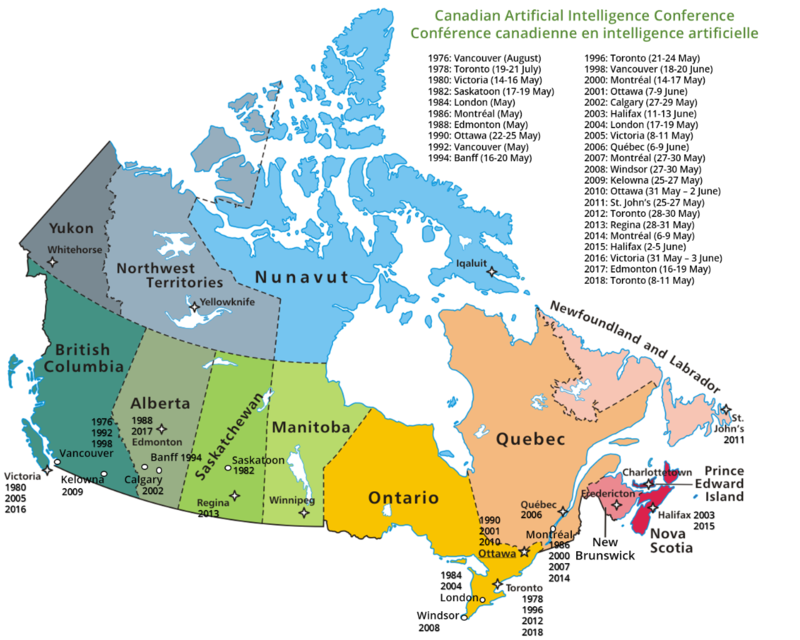 The event is collocated with the Canadian Graphics Interface and the Computer and Robot Vision conferences. These events (AI·GI·CRV 2018) will bring together hundreds of leaders in research, industry, and government, as well as Canada's most accomplished students. They showcase Canada's ingenuity, innovation and leadership in intelligent systems and advanced information and communications technology. A single registration lets you attend any session in the three conferences, which are scheduled in parallel tracks. Springer graciously offers a free download of the proceedings between 3 May and 3 June 2018, by following this link. Dr Jian Pei presents his talk How is big data science changing retail industry? Dr Amanda Stent from Bloomberg presents her talk AI for Unstructured Data in Finance. From l. to r.: Jackie C.K. Cheung, Yang Xiang, Dylan Loker and Ebrahim Bagheri. From l. to r.: Ebrahim Bagheri, Laurent Jakubina, Jackie C.K. Cheung. This year is the 31st Canadian Conference in Artificial Intelligence. Below is a map of the previous cities that have hosted the Conference over the years.